Oh check these ouuuut! The light side mascara and it’s waterproof too just in case you have to sob after your apprentice turns dark. You never know. The second reason I’m so happy is because my makeup was delivered todaaaay! 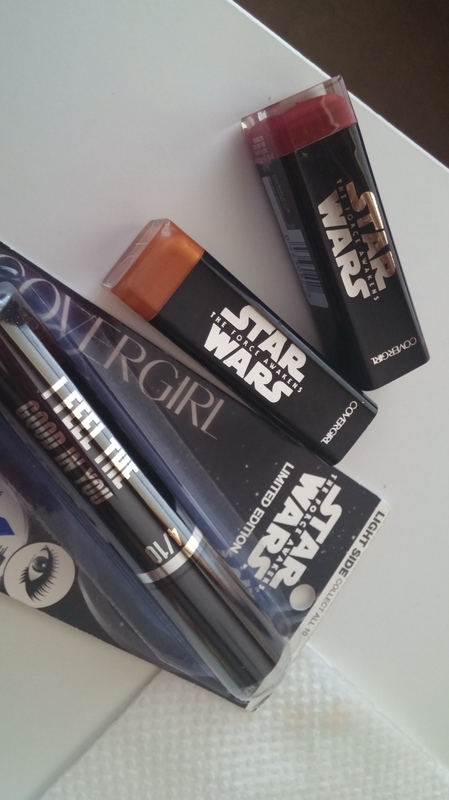 I ordered three products from CoverGirl’s limited edition Star Wars The Force Awakens line. AND I LOVE THEM SO MUUUUCH! I found these online through drugstore.com. If you’re interested in getting your grabby hands all up on these force-filled items. I bought items from both the light and the dark side. The red which is Red 30 and probably named something angry, I’m not entirely sure. Maybe, rage? Bloodlust? NOOOOO!? It’s this GORGEOUS sparkly deep red. It’s nothing like the reds I already own which if you know me, are quite a few. I’m so dark and full of bloodlust while wearing this lipstick you don’t even understand. I am channeling all the dark side feels. Ima go cut the grass with my lightsaber, angrily. The Gold 40 one is, I think, named Droid. If not, it’s super sparkle sparkle magic gold full of the power of the light side. 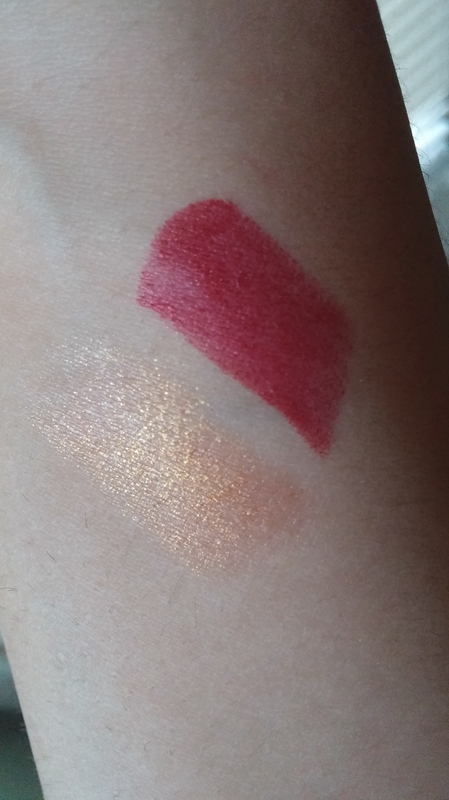 I was on the fence about this shade because it’s gold… BUT I was wrong and it is gorgeous. It looks stunning as is or could be combined with the red for a super festive fall lip full of fall magic and a mix of light side dark side babies. We are swatches of lipsticks. The gold one is droid (Gold 40) or Droid (I think) the red one is Red 30 I have no idea what the name for this one is but I’m sticking with NOOOOO! The mascara I bought was the light side one in “very black” and waterproof. Each mascara comes with a different little quote. You can collect all 10 quotes if you’re feeling extra spendy. I wasn’t! It does have the SuperSizer written on it which I think means it’s just the SuperSizer product inside a different tube. I tend to lean more towards all that is good so my eyelashes must be prepared to tackle all the sweat and tears. All in all, these products are adorable. Who says you can’t be a geek and look incredible? Lippies are gorgeous! They are always out of stock everytime I check them at walmart. 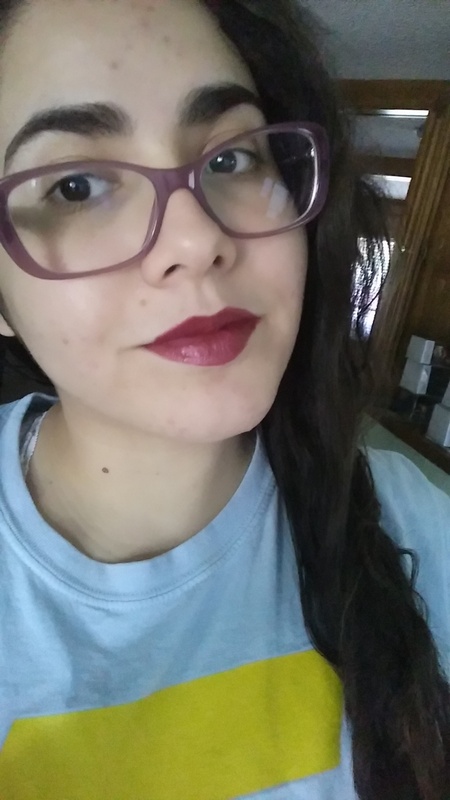 How’s the formula of both lipsticks? They’re smooth, hydrating, and easy to apply. I always worry about reds being hard to work with but this one truly isn’t. It hasn’t bleed yet which is fantastic and I didn’t even line my lips. They also smell pretty good. Oh man!! I’m so excited for this collection. That red color looks great on you! Thank you so much! I was too. I knew it was going to be released sometime in September so I got online and just searched. Drugstore.com always seems to have hard to find limited edition stuff. So if you have a hard time finding these I’d suggest getting them off there. I hope so too! Is CoverGirl not sold in Australia? So cool! I’m glad you used that new banner for your blog! Thanks! I’m going to have to edit it a bit in order to have it fit in well but I’m so excited! It is fantastic. Did you do it? Such cool artwork! I didn’t! My cousin is an INCREDIBLE illustrator and she made that for me. <3 She's the best! It is nice to have such awesome family connections. I wish people in my family had talent that they could share with me. Awww! ;___; maybe you have a distant cousin that makes pizzas? That would be great if a cousin owned a PIzza Hut.